"Portable, Secure, great choice for businesses already using VMware for server virtualization!!!!" 1. The convenient. I can install the clients and use it on all my devices. 2. I especially love using it on my Ipad. the fact that I do not have to take my laptop home with me everyday is great. I can work from home with my ipad as if i was in the office. 3. Provides a secure, yet rich desktop environment to work with. 4. I am able to utilize RSA hard/soft token authentication, which provides a confidence that I appreciate when working with sensitive data. 5. It's a great transition for the users from regular desktop PCs since each user is basically getting their own complete (virtual) computer system. For the same reason, the transition for the IT Desktop Support team from supporting full desktop machines to virtual machines is much easy for them to understand. 6. It is a good choice for businesses that are already using VMware for server virtualization. 7. It is very Simple, secure, and robust. 1. The requirements of the back-end systems such as storage IO and RAM requirements needed to make the system work to its full potential can be very expensive. VMware license cost are also a little high. 2. I would like the ability to extend the virtual desktop across multiple monitors on the fly. Right now I have to set that on login, and log back out to change it. 3. VMware Horizon is a great VDI solution but you must have a good backend to support it. 1. I will recommend that every company uses this product. It will bring great productivity to your working environment. 2. Take advantage of the RSA generated token for an extra layer of security. 3. Make sure to design a solid backend infrastructure. Get a SAN with a few Solid State drives that provide enough storage to run the shared images from. The more storage IOPS that your storage system can provide the smoother the user experience for the end users. "Great way to run windows on my Mac!" I use VMware Horizon at work to log into a Windows virtual desktop. I am running it on a Mac Pro, so as a Mac user I'm not a huge fan of Windows, but when I do have to use Windows, VMWare Horizon allows for me to have Windows running in its own window on my Mac. I am able to do all that I need through the Horizon app using a windows login. Most things are are pretty basic that I'm doing with it, so it seems to run really well. I do some screen recordings using Camtasia (another nice product) and I really haven't had any speed issues at all with the virtual desktop. The only things that I've noticed that is a little clunky is trying to get a usb flash drive or hard drive to connect to the virtual desktop. Sometimes it works great, other days it takes a few times to finally work. Its not a big deal because I can actually map a drive from my Mac to the virtual desktop and usually transfer files that way. Using a virtual client for my Windows needs all while using a Mac as my main computer has the cost of another laptop down for my area and makes it easy when I can use one keyboard and mouse to control two different operating systems. "Handy software for managing our VDI environments"
Web application allows for quick and easy connection for any device. Logically organized interface makes it easy to manage our catalogue of pools and devices. The knowledge management articles available when you have questions are wonderful. Tons of questions answered by the user base, and various official articles published from VMware. Not much I don't like. VERY small peeve, but when you change the status of a device in the catalogue list (lets say to have a device enter maintenance mode), it refreshes the list and you lose your place (if you were 350 rows down of a 500 row table for example - annoying to have to scroll down. I mentioned in one of my other reviews, but make sure you spend time with VMWare, having them consult for you and the setup that you need and want. Also make sure you purchase enough resources to be able to scale up quickly. We found the requests that came in to use our VDI setup were fast. We had procured enough hardware to cope with the influx of requests though. One location to manage our catalogue of various VDI devices and pools. I love the fact that Horizon allows you to connect to a virtual machine for business that allows you to share hardware, doesn't take up a lot of space on the computer and uses resources efficiently. The program is lightweight and for the most part, the connection is stable. The only thing I dislike is there are Windows 10 apps that you can get for Horizon but they don't offer a lot of settings like multiple monitors, etc. Sometimes, the VM connection will be lost and will take a while to reconnect but that may not even be an issue with Horizon. If you need a lightweight solution for connecting to a virtual desktop infrastructure, then Horizon is a great choice. Virtualization with Horizon has helped us get away from using a VPN server and allows agents to login to a desktop that has all of their tools that they need without having to install everything on their own machines. "Allows access to a virtual machine located on a separate server"
VMWare Horizon allows me to connect to a virtual machine on my company's main server. This allows our IT department to install certain programs on a single virtual machine that may be too bulky to install on many individual laptops. There is very little to dislike. The program does what it is intended to do quite well. I have two small complaints about the program. First, there is no way (of which I am aware) to copy and paste material from the virtual machine on to the computer your using to access the virtual machine. Second, I run multiple monitors. In fullscreen mode, the virtual machine shows up only on one monitor. Windows will not extend on to other monitors as though you are using the native operating system. If you have programs that require a large degree of processing power that is better suited to server, or if you want access to different operating systems without having to set up a dual-boot system on your personal computer (or buy two computers! ), then this program is highly recommended. I haven't experienced any troubles using it so far. Reducing space on personal work computers by installing a single copy of large or lesser-used programs on a single virtual machine located on the company server. "This is a excellent solution when considering Virtual Dekstops"
VMware Horizon gives me the freedom to work on the device I prefer as it is accessible from my zero client, tablet, smartphone and laptop. I get mobility with access to MY desktop from anywhere. As an administrator of Horizon I know I can scale up to quickly to meet seasonal or surge needs, expand to a new location, yet I’m still providing secure access for contract or temporary workers. It’s not a dislike, but make sure to set the expectations of using a desktop with a touch device. The Horizon solution does provide tools to make the transition easier. Make sure you take the time to understanding your current environment to know how this is going to be used. Define use cases during the testing phase in order to show that the solution will meet your expectations. You must use the right infrastructure in order to scale this VDI solution. Using systems not designed for VDI will work for a limited number of users, but have performance problems as you scale it out.. Make sure you are using a VDI solution for the appropriate needs. This keeps desktops and the information they generate safe which addresses my security and compliance concerns. I can give the appropriate access level for each employee or employee groups. The data created and/or accessed by contractors and temporary workers never leaves my data center, it stays safe with the hosted desktop. I really like that the Horizon solution allows the workforce to continue working during disruptions like illness, weather or any other situations that keep user out of the office. This solution keeps employees connected by providing access to their same desktop securely from home or other remote locations. "VMware Horizon is a great VDI solution if you have a good backend to support it"
It's a great transition for the users from regular desktop PCs since each user is basically getting their own complete (virtual) computer system. For the same reason, the transition for the IT Desktop Support team from supporting full desktop machines to virtual machines is much easy for them to understand. Also a good choice for businesses that are already using VMware for server virtualization. The requirements of the back-end systems such as storage IO and RAM requirements needed to make the system work to its full potential can be very expensive. VMware license cost are also a little high. Make sure to design a solid backend infrastructure. Get a SAN with a few Solid State drives that provide enough storage to run the shared images from. The more storage IOPS that your storage system can provide the smoother the user experience for the end users. Over several years you should see a return on the investment due to a reduction in the need to refresh the computer systems out in the field and a decrease in the number of staff needed to support the desktop systems since they're easily reset. OS and software upgrades/deployments are much easier and quicker when using shared OS images. Horizon is a great solution for higher Ed. It helps to reduce the cost and complexity of physical desktops. Being able to centrally manage a lab environment is a big time saver. Done right, even complex applications perform well vitalized. "Use this to access my enterprise network to access tools limited by that network connection"
I like that it breaks out of the restrictions of a local enterprise internet connection security blocks, so if I want to install a new tool I'm able to do so without approval which speeds up my development. on MacBook Pro it doesn't dual screen. Using my desktop PC I've noticed I can make use of all screens I have connected, but for the MAC it's one screen and the resolution isn't always great even in fullscreen it ends up with black bars on top and bottom. Support macbook pro multiple displays as many frontend/UX/UI developers use these machines though a majority of users have thinkpads, but they have a large impact on those that will see these tools on those machines. "Can make client and user management very easy." I love having control of all of a company's workforce, desktop computers in one location! I can push out updates to any or all clients with the click of a button or roll them back if an update causes issue. It is quite a bit of work to set up for the use. If you are willing to put in the work, it's worth using. After initial setup, it requires very little work or effort to do routine maintenance or updates. Really, one IT employee can manage many client computers quite easily. "Used over the years as a desktop virtualization platform"
Very robust and feature rich. You can do so much with this product. Very easy to create new desktops and integrates well into vSphere platform. You can also quickly refresh or reset a users desktop which save a ton of time. The Thinapp and ability to move app's around to users is also a huge plus. Slow and old desktops, really expensive desktops only being utilized to 10% of there potential. Also wanted to solve IT helpdesk spending hours rebuilding and reimaging computers. Virtual desktops also helped us create uniform security and standards for desktops quickly and easily. VMware Horizon gives me the ability to access a virtual machine behind my client's private network. This essentially gives me VPN access from anywhere in the world into the client's ecosystem. In general, this works wonderfully and gives me the ability to work remotely. When on a stable connection, I generally experience little to no lag or input delay. It is not open source software, but that's to be expected since it is owned by VMware. It is available on multiple platforms, but I've only had experience using it on OSX. My experience has been generally pretty good, except sometimes when I lose connection, the app will crash all together. This is undesirable and should be fixed. Updates do not seem very frequent (most likely due to it being closed source) and that could explain why the app is somewhat buggy. I would recommend trying it out on other platforms (such as Windows) since the OSX application seems to be a little buggy. I'm confident that it will be updated in the future to address these issues. It has allowed me to remotely connect to my client's network without physically being there. This is done through connecting to a virtual Windows desktop. This has saved me countless hours and the ability to work remotely. "It is a great way for using virtualization"
It has a great "app view" where you can easily find the apps you use the most. And it is pretty fast, it is a solution I would recommend to any medium or big company. The interface is really nice, it's good-looking to the human eye. The UX is extraordinary, it is easy and a user without experience can get well-adapted by working some time in it. It is not easy to find this solution for virtualisation. I mean, the website is has a good-looking interface but try to be more "apple", they put their products on their first page, in their menu on top, this allows people to find it more. The User and Advanced should have more enterprise characteristics with the same price they have. There should be an option with low-cost, so new and small companies can see what it can do. There should be a free app on the Mac AppStore, with a subscription or a one-time option. This store has not so many excellent apps and it would be a great way to promote ir with the people. It can get easily to the best apps with some time. Just think about the number of macs that are been sold each year. People look inside the Mac Appstore looking for great apps for their Macs. Try to be everywhere, facebook ads, instagram ads, there are so many ways to promote your product. Look all the options in internet and try to use the one that best fits your interests, this platform is more for medium and big size companies. Virtualisation of some Windows apps that can not run natively on Mac OS X. "easy remote desktop access as easy as a download"
sometimes it would get hung or when you log in at home then back at work it would rearrange all your desktop icons. "I've managed to make my life easier." The ability to have every virtualized enviroment (mostly for production sites and such) i need boot up in seconds is awesome. Also, i have an OCD when security is needed, so being able to setup and configure infrastructure's networks is way beyond what i would've needed, which is the best!. At this moment, everything is fine. I've been able to do what i've needed, so it's ok. For me.. Setting up multiple VMs (Linux servers and Windows 7), as always VMWare has been always my go-to virtualization center. I'm able to create and delete as many virtual machines i need and tweak their settings with ease. "Use it for connecting from home"
Program works well on mac and windows systems. I use it daily to connect to work to access some applications that i use. I have installed it on a lot of users systems with no issues. It does not support dual monitors and that would be a great feature to add. Other than that it is a fast application that works well and does the job. 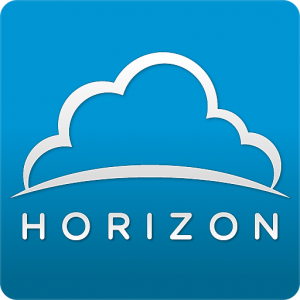 "Horizon is a user friendly and easy to use "
Horizon provides an approachable platform that is easy to navigate. Some reports are not as intuitive as they could be. Horizon 7 is a very accessible software that provides users with ease of use; has few glitches; and serves its purpose. While the software seems simple on the surface, it has strong capabilities. I am not in charge of solving problems. The system upgrades are subtle; however, I appreciate that the system connects to the OPAC. "Backbone of my software infrastructure"
Just-in-Time Delivery with Instant Clone Technology is best and most used tool for my problems. Virtual Storage is nice and most helpful. I think more options can be provided in UI for clone and creating new environments. Don't think much. This is the best product in the market and it will always give good returns in the future. The benefit of Horizon is that i don't have to maintain my own server fleet and my fleet in managed by horizon. Perfect solution to quickly deliver virtual desktops environment. It easily integrates with your existing VMware vSphere environment. We use Horizon View to deliver PCoIP training system, VDI is being accessed using Samsung PCoIP enabled screens. Really neat solution easy to move around company and set up quickly. "I use it everyday and i live it "
I will recommend that every company uses this product. It will bring great productivity to your working environment. "Interesting experience, one of the best virtualization technology products"
- Speed of execution commands. - Good remote desktop capabilities. - The upgrades are likely troublesome, some functionnalities don't work and require specific troubleshooting. VMware Horizon is the best tool you can use for a non requiring ressources systems. With its speed you can work on remote desktops like your own desktop. Performance testing: we use many injectors (VM) to do one test campaign. We need virualization tools that doesn't require lots of ressources in order to keep the load only on the tested applications. There is a plethora of deployment and connection options. Instant clone pools are really fast. Not all options have the a full feature parity, there is a plethora of management interfaces. Not all web admin interfaces work with all browsers. patching desktops and software still too complicated. services can break without failing and need custom rules made in your monitoring suite for proper alerting. Labs that need to be refreshed constantly or to provide the required compute resources for tasks that traditionally would have been in an extremely heterogeneous BYOD environment. "I use this product to log on remotely to my firm's operating system." The interface is smooth - it is a direct transition from my home computer to work computer. The product also allows me to connect to my home printer from the work operating system. Sometimes it takes multiple tries to log on to the system. Sometimes the system does not all my typing to be recognized and forces me to log off and log back on. Useful tool, when the bugs don't interfere with my logging on. The problem is working remotely without access to a hardwire into the firm's operating system. The benefit is that it allows me to do so. Features, ease of use and capabilities that are offered. Very good software when handling with multiple tasks at one time, allows to switch desktops with tasks. Actually now it's not something needed as newest Windows 10 has similar feature. It's quite useful when being a developer, also allows to do multitasking even better. "My company just started using this product recently." I'm an IT Consultant and we recently deployed VMware Horizon for the first time. Our client loves the setup and each user has the ability to remote into their own physical desktop or virtual desktop. Since it was our first deployment it was a little confusing to setup but once everything is up and running it works great. Using Horizon solves the problem of the end users connecting into their networks from outside the office and gives them full access to their physical or virtual machines. Very convenient to use on my phone, laptop, and iPad! The appearance is very straightforward and suitable for all ages. Sometimes it takes too long to log in on the server, but I think that may be due to the wifi and not the software. Regardless, I want to highlight that! Currently, we are working on integrating our servers and promoting social media to expand our client base. The benefits of social media are tremendous! People connect so easily with the tool. "We run old Windows software on iPads"
With Horizon we run old Windows application on iPad in some of our facilities. It's doing the job and the speed is reasonable. Connection timeout and lags are my main issue with Horizon. I don't know if it's our network or their system but it's not as fast as I like it to be. Running old apps on newer devices. Provides a secure, yet rich desktop environment to work with. I am able to utilize RSA hard/soft token authentication, which provides a confidence that I appreciate when working with sensitive data. I would like the ability to extend the virtual desktop across multiple monitors on the fly. Right now I have to set that on login, and log back out to change it. Take advantage of the RSA generated token for an extra layer of security. I need to utilize multiple environments for analysis, development, and user-experience testing. Horizon provides a fantastic interface to provide access to the resources I need. It is a fairly simple to use application. If you are providing guidance, setup the server settings automatically so the vendor does not have to. "Works, but is closed-source/proprietary and therefore unusable." Horizon View works well, provides clients for just about every OS (including Chromebooks), VM automation on the server side, and a decent management console. The system is closed-source software, meaning you're at VMware's mercy for upgrades / modifications, and none of the code can be audited (and therefore it cannot be trusted). Given that there are so many FOSS alternatives (like oVirt, Spice, and Citrix XenServer), there's basically no reason to use VMware. Don't... just don't. Use a FOSS alternative like oVirt, Spice, or Citrix XenServer. "It was worth the investment"
I like its efficient resource management in demanding environment. Unlike with Citrix XenDesktop, we don't need to switch our Windows 7 theme to classic view in order to save up bandwidth. "Improved user experience, better desktops, less help desk calls...."
The connection servers are easy to deploy. New features such as Blast work better in some of our branch offices. The Access Point server documentation and support is sparse at this point. Difficult to deploy, so probably just going back to the Security server model. Desktop updates, patching, and application deployments were hard to manage with physical desktops. If users get a virus or malware, it's very easy to rebuild their desktops. We can deploy a large number of new machines in a very short amount of time. "I have used it for a while now"
I like most of the products from VMWare and have been using them for my research. The thing that I like the most about Horizon is the ability to use a single platform for virtual and hosted applications. "Great product for home users"
Easy setup and updates of desktops. Great for deploying new software. Easy install and setup of clients. Patching and updating software on guests can be done quickly and efficiently. Lots of individual systems to keep up to date. Great program for distributing Windows based applications. Easy corporate access for consultants. Consultants can be onboarded in a day. "Using it for a while"
One of the best things about VMware Horizon is that it allow me to access all my VMs, the applications and different online service using just a single workspace. I am using it for office work. We usually have to switch between different VMs for reports and research. The number of features and it give us a many way to admin. It could have a more clean User Interface. Deploying systems for multiple end users. * We monitor all Horizon 7 reviews to prevent fraudulent reviews and keep review quality high. We do not post reviews by company employees or direct competitors. Validated reviews require the user to submit a screenshot of the product containing their user ID, in order to verify a user is an actual user of the product. Hi there! Are you looking to implement a solution like Horizon 7?